The Arctic consists of land, internal waters, territorial seas, exclusive economic zones (EEZs) and high seas. All land, internal waters, territorial seas and EEZs in the Arctic are under the jurisdiction of one of the eight Arctic coastal states: Canada, Norway, Russia, Denmark (via Greenland), Iceland, Sweden, Finland and the United States. International law regulates this area as with other portions of the Earth. Under international law, the high seas including the North Pole and the region of the Arctic Ocean surrounding it, are not owned by any country. The five surrounding Arctic countries are limited to an exclusive economic zone (EEZ) of 200 nautical miles (370 km; 230 mi) adjacent to their coasts. The waters beyond the EEZs of the coastal states are considered the "high seas" (i.e. international waters). The sea bottom beyond the exclusive economic zones and confirmed extended continental shelf claims are considered to be the "heritage of all mankind" where exploration and exploitation of mineral resources is administered by the UN International Seabed Authority. Upon ratification of the United Nations Convention on the Law of the Sea (UNCLOS), a country has a ten-year period to make claims to an extended continental shelf which, if validated, gives it exclusive rights to resources on or below the seabed of that extended shelf area. Norway, Russia, Canada, and Denmark launched projects to provide a basis for seabed claims on extended continental shelves beyond their exclusive economic zones. The United States has signed, but not yet ratified the UNCLOS. The status of certain portions of the Arctic sea region is in dispute for various reasons. Canada, Denmark, Norway, Russia, and the United States all regard parts of the Arctic seas as national waters (territorial waters out to 12 nautical miles (22 km)) or internal waters. There also are disputes regarding what passages constitute international seaways and rights to passage along them. There is one single disputed piece of land in the Arctic—Hans Island—which is disputed between Canada and Denmark because of its location in the middle of an international strait. In 1925, based upon the Sector Principle, Canada became the first country to extend its maritime boundaries northward to the North Pole, at least on paper, between 60°W and 141°W longitude, a claim that is not universally recognized (there are 415 nmi (769 km; 478 mi) of ocean between the Pole and Canada's northernmost land point). On April 15 the following year, the Presidium of the Supreme Soviet of the USSR declared the territory between two lines (32°04′35″E to 168°49′30″W) drawn from west of Murmansk to the North Pole and from the eastern Chukchi Peninsula to the North Pole to be Soviet territory. Norway (5°E to 35°E) made similar sector claims, as did the United States (170°W to 141°W), but that sector contained only a few islands, so the claim was not pressed. Denmark's sovereignty over all of Greenland was recognized by the United States in 1916 and by an international court in 1933. Denmark could also conceivably claim an Arctic sector (60°W to 10°W). In the context of the Cold War, Canada sent Inuit families to the far north in the High Arctic relocation, partly to establish territoriality. The Canadian monarch, Queen Elizabeth II, accompanied by the Duke of Edinburgh, Prince Charles, and Princess Anne, undertook in 1970 a tour of Northern Canada, in part to demonstrate to an unconvinced American government and the Soviet Union that Canada had certain claim to its Arctic territories, which were strategic during the Cold War. In addition, Canada claims the water within the Canadian Arctic Archipelago as its own internal waters. The United States is one of the countries which does not recognize Canada's, or any other countries', Arctic archipelagic water claims and has allegedly sent nuclear submarines under the ice near Canadian islands without requesting permission. Until 1999, the North Pole and the major part of the Arctic Ocean had been generally considered to comprise international space, including both the waters and the sea bottom. However, both the adoption of the United Nations Convention on the Law of the Sea (UNCLOS) as well as global climate change causing the polar ice seasonally to recede farther than these nations had expected due to climate change has prompted several countries to claim or to reinforce pre-existing claims to the waters or seabed of the polar region. As defined by the UNCLOS, states have ten years from the date of ratification to make claims to an extended continental shelf. They must present to the Commission on the Limits of the Continental Shelf, a UN body, geological evidence that their shelf effectively extends beyond the 200 nautical miles limit. The Commission does not define borders but merely judges the scientific validity of assertions and it is up to countries with rightful but overlapping claims to come to a settlement. On this basis, four of the five states fronting the Arctic Ocean – Canada, Denmark, Norway, and the Russian Federation – must have made any desired claims by 2013, 2014, 2006, and 2007 respectively. Since the U.S. has yet to ratify the UNCLOS, the date for its submission is undetermined at this time. Claims to extended continental shelves, if deemed valid, give the claimant state exclusive rights to the sea bottom and resources below the bottom. Valid extended continental shelf claims do not and cannot extend a state's Exclusive Economic Zone (EEZ) since the EEZ is determined solely by drawing a 200-nautical-mile (370 km) line using territorial sea baselines as their starting point. Press reports often confuse the facts and assert that extended continental shelf claims expand a state's EEZ thereby giving a state exclusive rights to resources not only on the sea bottom or below it, but also to those in the water column above it. The Arctic chart prepared by Durham University explicitly illustrates the extent of the uncontested Exclusive Economic Zones of the five states bordering the Arctic Ocean, and also the relatively small expanse of remaining "high seas" or totally international waters at the very North of the planet. Canada ratified UNCLOS on 7 November 2003 and had through 2013 to file its claim to an extended continental shelf. As of December 2013[update], Canada had announced that it would file a claim which includes the North Pole. Canada plans to submit their claim to a portion of the Arctic continental shelf in 2018. In response to the Russian Arktika 2007 expedition, Canada's Foreign Affairs Minister, Peter MacKay, said "[t]his is posturing. This is the true north strong and free, and they're fooling themselves if they think dropping a flag on the ocean floor is going to change anything... This isn't the 14th or 15th century." In response, Sergey Lavrov, the Russian Minister of Foreign Affairs, stated "[w]hen pioneers reach a point hitherto unexplored by anybody, it is customary to leave flags there. Such was the case on the Moon, by the way... [W]e from the outset said that this expedition was part of the big work being carried out under the UN Convention on the Law of the Sea, within the international authority where Russia's claim to submerged ridges which we believe to be an extension of our shelf is being considered. We know that this has to be proved. The ground samples that were taken will serve the work to prepare that evidence." On 25 September 2007, Prime Minister Stephen Harper said he was assured by Russian President Vladimir Putin that neither offence nor "violation of international understanding or and Canadian sovereignty" was intended. Harper promised to advise the Crown to defend Canada's claimed sovereignty by building and operating up to eight Arctic patrol ships, a new army training centre in Resolute Bay, and the refurbishing of an existing deepwater port at a former mining site in Nanisivik. Denmark ratified UNCLOS on 16 November 2004 and had through 2014 to file a claim to an extended continental shelf. The Kingdom of Denmark simultaneously declared, that ratifying UNCLOS did not change Denmark's position that the Danish straits including the Great Belt, the Little Belt, and the Danish part of Øresund, formed on the foundation of the Copenhagen Treaty of 1857 are legally Danish territory, and – as set out in the treaty section of the United Nations Office of Legal Affairs – this should remain so. Consequently, Denmark considers the Copenhagen Convention to apply solely to the waterways through Denmark proper and not the North Atlantic. Greenland, an autonomous country within the Kingdom of Denmark, has the nearest coastline to the North Pole, and Denmark argues that the Lomonosov Ridge is in fact an extension of Greenland. Danish project included LORITA-1 expedition in April–May 2006 and included tectonic research during LOMROG expedition, which were part of the 2007–2008 International Polar Year program. It comprised the Swedish icebreaker Oden and Russian nuclear icebreaker NS 50 Let Pobedy. The latter led the expedition through the ice fields to the research location. 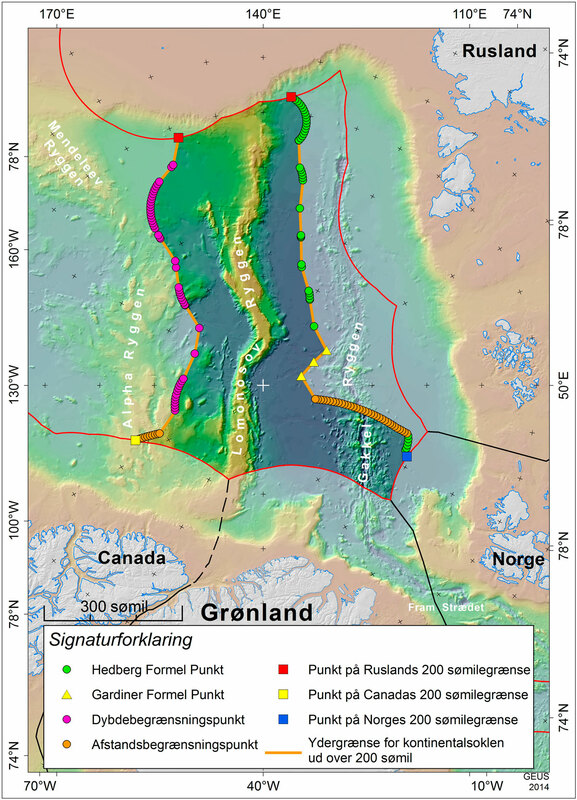 Further efforts at geological study in the region were carried out by the LOMROG II expedition, which took place in 2009, and the LOMROG III expedition, launched in 2012. 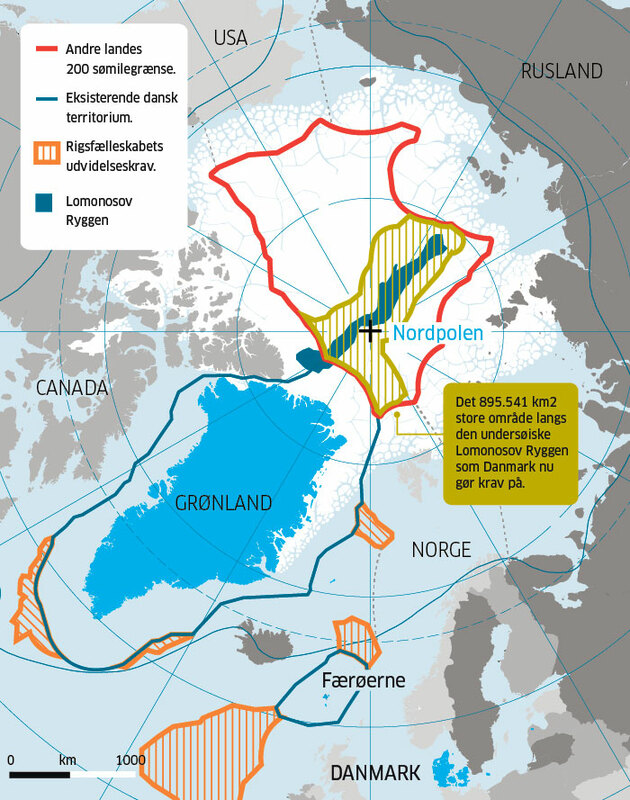 On 14 December 2014 Denmark claimed an area of 895,000 km2 extending from Greenland past the North Pole to the limits of the Russian Exclusive Economic Zone. Unlike the Russian claim which is generally limited to the Russia sector of the Arctic, the Danish Claim extends across the North Pole and into Russia's sector. Norway ratified the UNCLOS on 24 June 1996 and had through 2006 to file a claim to an extended continental shelf. On November 27, 2006, Norway made an official submission into the UN Commission on the Limits of the Continental Shelf in accordance with the United Nations Convention on the Law of the Sea (article 76, paragraph 8). There are provided arguments to extend the Norwegian seabed claim beyond the 200 nmi (370 km; 230 mi) EEZ in three areas of the northeastern Atlantic and the Arctic: the "Loop Hole" in the Barents Sea, the Western Nansen Basin in the Arctic Ocean, and the "Banana Hole" in the Norwegian Sea. The submission also states that an additional submission for continental shelf limits in other areas may be posted later. Norway and Russia have ratified an agreement on the Barents Sea, ending a 40-year demarcation dispute. Russia ratified the UNCLOS in 1997 and had through 2007 to make a claim to an extended continental shelf. The Russian Federation is claiming a large extended continental shelf as far as the North Pole based on the Lomonosov Ridge within their Arctic sector. Moscow believes the eastern Lomonosov Ridge is an extension of the Siberian continental shelf. The Russian claim does not cross the Russia-US Arctic sector demarcation line, nor does it extend into the Arctic sector of any other Arctic coastal state. On December 20, 2001, Russia made an official submission into the UN Commission on the Limits of the Continental Shelf in accordance with the United Nations Convention on the Law of the Sea (article 76, paragraph 8). 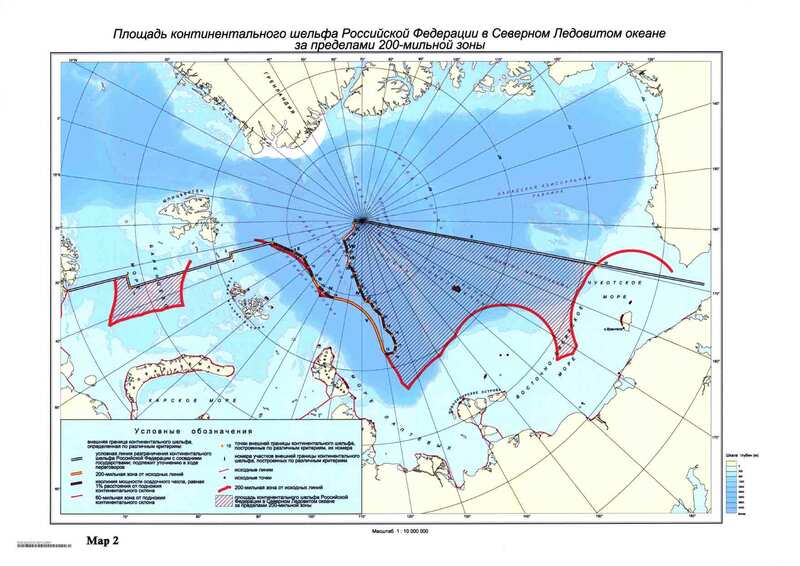 In the document it is proposed to establish the outer limits of the continental shelf of Russia beyond the 200-nautical-mile (370 km) Exclusive Economic Zone, but within the Russian Arctic sector. The territory claimed by Russia in the submission is a large portion of the Arctic within its sector, extending to but not beyond the geographic North Pole. One of the arguments was a statement that Lomonosov Ridge, an underwater mountain ridge passing near the Pole, and Mendeleev Ridge on the Russian side of the Pole are extensions of the Eurasian continent. In 2002 the UN Commission neither rejected nor accepted the Russian proposal, recommending additional research. On August 2, 2007, a Russian expedition called Arktika 2007, composed of six explorers led by Artur Chilingarov, employing MIR submersibles, for the first time in history descended to the seabed at the North Pole. There they planted a Russian flag and took water and soil samples for analysis, continuing a mission to provide additional evidence related to the Russian extended continental shelf claim including the mineral riches of the Arctic. This was part of the ongoing 2007 Russian North Pole expedition within the program of the 2007–2008 International Polar Year. The expedition aimed to establish that the eastern section of seabed passing close to the Pole, known as the Lomonosov Ridge, is in fact an extension of Russia's landmass. The expedition came as several countries are trying to extend their rights over sections of the Arctic Ocean floor. Both Norway and Denmark are carrying out surveys to this end. Vladimir Putin made a speech on a nuclear icebreaker on 3 May 2007, urging greater efforts to secure Russia's "strategic, economic, scientific and defense interests" in the Arctic. On August 4, 2015, Russia submitted additional data in support of its bid, containing new arguments based on "ample scientific data collected in years of Arctic research", for territories in the Arctic to the United Nations. Through this bid, Russia is claiming 1.2 million square kilometers (over 463,000 square miles) of Arctic sea shelf extending more than 350 nautical miles (about 650 kilometers) from the shore. In February 2016 additional data was submitted by Russian Minister of Natural Resources and Environment Sergey Donskoy. After the expedition "Arktika 2007" Russian researchers collected new data reinforcing Russia's claim to part of the sea bottom beyond the 200-mile zone within its entire Arctic sector, the North Pole area included. On August 9, 2016 the UN Commission on the Limits of the Continental Shelf started working on the issue. As of 2018[update], the United States has not ratified the UN Convention on the Law of the Sea (UNCLOS) and, therefore, is not yet eligible to file an official claim to an extended continental shelf with the UN Commission on the Limits of the Continental Shelf. In August 2007, an American Coast Guard icebreaker, the USCGC Healy, headed to the Arctic Ocean to map the sea floor off Alaska. Larry Mayer, director of the Center for Coastal and Ocean Mapping at the University of New Hampshire, stated the trip had been planned for months, having nothing to do with the Russians planting their flag. The purpose of the mapping work aboard the Healy is to determine the extent of the continental shelf north of Alaska. It was stated by the Intergovernmental Panel on Climate Change on March 25, 2007, that riches are awaiting the shipping industry due to Arctic climate change. This economic sector could be transformed similar to the way the Middle East was by the Suez Canal in the 19th century. There will be a race among nations for oil, fish, diamonds and shipping routes, accelerated by the impact of global warming. The potential value of the North Pole and the surrounding area resides not so much in shipping itself but in the possibility that lucrative petroleum and natural gas reserves exist below the sea floor. Such reserves are known to exist under the Beaufort Sea. However, the vast majority of the Arctic known to contain gas and oil resources is already within uncontested EEZs. When these current uncontested Exclusive Economic Zones (EEZ) of the Arctic littoral states are taken into account there is only a small unclaimed area at the very top potentially available for open gas/oil exploration. On September 14, 2007 the European Space Agency reported ice loss had opened up the Northwest Passage "for the first time since records began in 1978", and the extreme loss in 2007 rendered the passage "fully navigable". Further exploration for petroleum reserves elsewhere in the Arctic may now become more feasible, and the passage may become a regular channel of international shipping and commerce if Canada is not able to enforce its claim to it. Foreign Ministers and other officials representing Canada, Denmark, Norway, Russia, and the United States met in Ilulissat, Greenland in May 2008, at the Arctic Ocean Conference and announced the Ilulissat Declaration. Among other things the declaration stated that any demarcation issues in the Arctic should be resolved on a bilateral basis between contesting parties. Hans Island is situated in the Nares Strait, a waterway that runs between Ellesmere Island (the northernmost part of Nunavut, Canada) and Greenland. The small uninhabited island, sized 1.3 km2 (0.5 sq mi), was named for Greenlandic Arctic traveller Hans Hendrik. In 1973, Canada and Denmark negotiated the geographic coordinates of the continental shelf, and settled on a delimitation treaty that was ratified by the United Nations on December 17, 1973, and has been in force since March 13, 1974. The treaty lists 127 points (by latitude and longitude) from Davis Strait to the end of Robeson Channel, where Nares Strait runs into Lincoln Sea; the border is defined by geodesic lines between these points. The treaty does not, however, draw a line from point 122 (80°49′2″N 66°29′0″W﻿ / ﻿80.81722°N 66.48333°W﻿ / 80.81722; -66.48333) to point 123 (80°49′8″N 66°26′3″W﻿ / ﻿80.81889°N 66.43417°W﻿ / 80.81889; -66.43417)—a distance of 875 m (0.54 mi). Hans Island is situated in the centre of this area. Danish flags were planted on Hans Island in 1984, 1988, 1995 and 2003. The Canadian government formally protested these actions. In July 2005, former Canadian defence minister Bill Graham made an unannounced stop on Hans Island during a trip to the Arctic; this launched yet another diplomatic quarrel between the governments, and a truce was called that September. 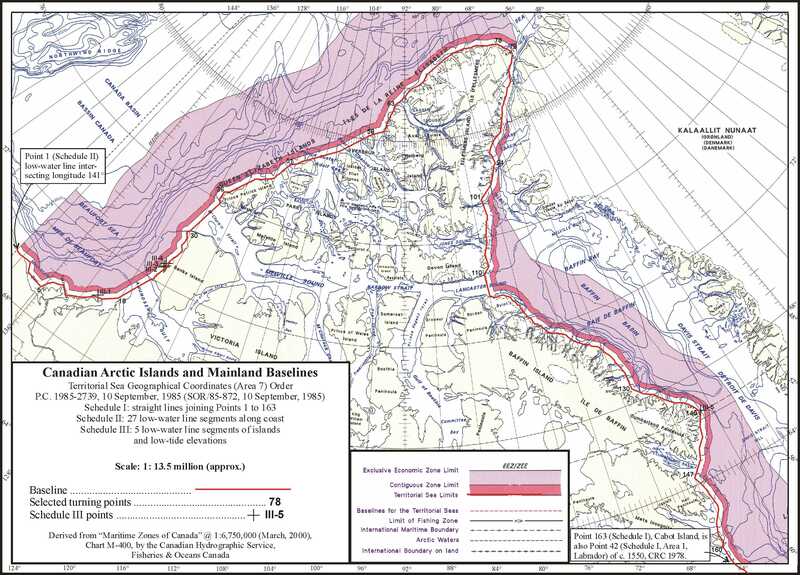 Canada had claimed Hans Island was clearly in its territory, as topographic maps originally used in 1967 to determine the island's coordinates clearly showed the entire island on Canada's side of the delimitation line. However, federal officials reviewed the latest satellite imagery in July 2007, and conceded that the line went roughly through the middle of the island. This presently leaves ownership of the island disputed, with claims over fishing grounds and future access to the Northwest Passage possibly at stake as well. As of April 2012, the governments of both countries are in negotiations which may ultimately result in the island being split almost precisely in half. The negotiations ended in November 2012 and gave a more exact border description, but did not solve the dispute over Hans Island. One possible resolution would be to treat the island as a condominium. 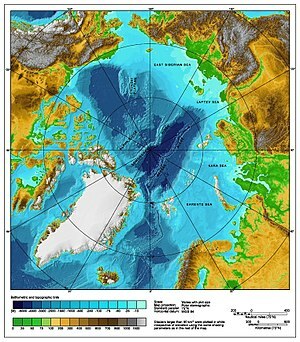 There is an ongoing dispute involving a wedge-shaped slice on the International Boundary in the Beaufort Sea, between the Canadian territory of Yukon and the American state of Alaska. The Canadian position is that the maritime boundary should follow the land boundary. The American position is that the maritime boundary should extend along a path equidistant from the coasts of the two nations. The disputed area may hold significant hydrocarbon reserves. The US has already leased eight plots of terrain below the water to search for and possibly bring to market oil reserves that may exist there. Canada has protested diplomatically in response. No settlement has been reached to date, because the US has signed but has not ratified the United Nations Convention on the Law of the Sea (UNCLOS). If the treaty is ratified, the issue would likely be settled at a tribunal. On August 20, 2009 United States Secretary of Commerce Gary Locke announced a moratorium on fishing the Beaufort Sea north of Alaska, including the disputed waters. Randy Boswell, of Canada.com wrote that the disputed area covered a 21,436 square kilometres (8,276 sq mi) section of the Beaufort Sea (smaller than Israel, larger than El Salvador). He wrote that Canada had filed a "diplomatic note" with the United States in April when the US first announced plans for the moratorium. The legal status of the Northwest Passage is disputed: Canada considers it to be part of its internal waters according to the UNCLOS. The United States and most maritime nations consider them to be an international strait, which means that foreign vessels have right of "transit passage". In such a regime, Canada would have the right to enact fishing and environmental regulation, and fiscal and smuggling laws, as well as laws intended for the safety of shipping, but not the right to close the passage. In addition, the environmental regulations allowed under the UNCLOS are not as robust as those allowed if the Northwest Passage is part of Canada's internal waters. Russia considers portions of the Northern Sea Route which encompasses navigational routes through waters within Russia's Arctic EEZ east from Novaya Zemlya to the Bering Strait to pass through Russian internal waters. ^ "United Nations Convention on the Law of the Sea (Annex 2, Article 4)". Retrieved 2007-07-26. ^ Drawbaugh, Kevin (October 31, 2007). "U.S. Senate panel backs Law of the Sea treaty". Reuter. ^ "President's Statement on Advancing U.S. Interests in the World's Oceans". Georgewbush-whitehouse.archives.gov. 2007-05-15. Retrieved 2012-01-10. ^ Dussault, René; Erasmus, George (1994). "The High Arctic Relocation- A Report on the 1953–55 Relocation (Royal Commission on Aboriginal Peoples)". Canadian Government Publishing. p. 190. Archived from the original on 2009-10-01. ^ Halloran, Richard (4 May 1987). "U.S. Suspicious Of Canada's Plan For Nuclear Subs". New York Times. Retrieved 25 November 2017. ^ "Scientific Facts on Arctic Climate Change". greenfacts.org. Retrieved 8 May 2015. ^ Lasserre, Frédéric (November 2011). "The Geopolitics of Arctic Passages and Continental Shelves" (PDF). Public Sector Digest. ^ "Maritime jurisdiction and boundaries in the Arctic region" (PDF). International Boundaries Research Unit, Durham University. 2008-07-24. ^ "Canada to claim north pole as its own". Associated Press in Toronto. The Guardian. December 9, 2013. Retrieved 10 December 2013. ^ International, Radio Canada (3 May 2016). "Canada to submit its Arctic continental shelf claim in 2018". www.rcinet.ca. Retrieved 25 February 2017. ^ Reynolds, Paul (2008-05-29). "Trying to head off an Arctic 'gold rush'". BBC News. Retrieved 2012-01-10. ^ "Russia plants flag staking claim to Arctic region". Cbc.ca. 2007-08-02. Retrieved 2012-01-10. ^ "Transcript of Remarks and Replies to Media Questions by Russian Minister of Foreign Affairs Sergey Lavrov at Joint Press Conference with Philippine Foreign Affairs Secretary A". Mid.ru. Retrieved 2012-01-10. ^ Lackenbauer, P. Whitney; Morrisson, William; Poelzer, Greg (2008). Arctic Front: Defending Canada in the Far North. Thomas Allen Publishers. pp. 109–. ISBN 9780887628405. Retrieved 2012-10-13. ^ "A Conversation with Stephen Harper [Rush Transcript; Federal News Service] – Council on Foreign Relations". Cfr.org. Archived from the original on 2009-03-02. Retrieved 2012-01-10. ^ "Harper announces northern deep-sea port, training site". CBC News. 2007-08-11. ^ "United Nations Oceans & Law of the Sea". 12 July 2011. Retrieved 2012-05-22. ^ "Territorial claims – The Right Arctic". Arcticcontroversy.weebly.com. Retrieved 2015-05-31. ^ Kontinentalsokkelprojektet. "LORITA-1 (Lomonosov Ridge Test of Appurtenance)". A76.dk. Archived from the original on 2009-03-26. Retrieved 2012-01-10. ^ "LOMROG – Lomonosov Ridge off Greenland". Geo.su.se. Archived from the original on 2011-09-30. Retrieved 2012-01-10. ^ Kontinentalsokkelprojektet. "LOMROG 2007 cruise with the Swedish icebreaker Oden north of Greenland". A76.dk. Archived from the original on 2009-04-13. Retrieved 2012-01-10. ^ "LOMROG III expedition in 2012 with the Swedish icebreaker Oden". The Continental Shelf Project. Retrieved August 1, 2012. ^ "Submission by the Kingdom of Denmark" United Nations Convention on the Law of the Sea, 15 December 2014. Accessed: 15 December 2014. ^ "Denmark challenges Russia and Canada over North Pole". BBC News. Retrieved 8 May 2015. ^ Ramskov, Jens. "Derfor gør Danmark nu krav på Nordpolen" In English Ingeniøren, 15 December 2014. Accessed: 15 December 2014. ^ "Continental Shelf – submission to the Commission by Norway". un.org. Retrieved 8 May 2015. ^ "Evolution of Arctic Territorial Claims and Agreements: A Timeline (1903–Present)" Henry L. Stimson Center, 15 September 2013. Accessed: 17 December 2014. ^ "Treaty on Maritime Delimitation and Cooperation in the Barents Sea and the Arctic Ocean" Norwegian Government, 15 September 2010. ^ a b "Continental Shelf – submission to the Commission by the Russian Federation". un.org. Retrieved 8 May 2015. ^ "Lomonosov Ridge, Mendeleyev elevation part of Russia's shelf – report". Interfax Moscow. 2007-09-20. Archived from the original on May 25, 2011. Retrieved 2007-09-21. ^ "Russia's Arctic Claim Backed By Rocks, Officials Say". News.nationalgeographic.com. 2010-10-28. Retrieved 2012-01-10. ^ "Russia to UN: We are claiming 463,000 square miles of the Arctic". Retrieved 2015-08-05. ^ "The Big Melt: A Series About the Arctic and Climate Change From The New York Times". Archived from the original on August 28, 2007. Retrieved July 26, 2007. ^ "Satellites witness lowest Arctic ice coverage in history". Retrieved 2007-09-14. ^ "Warming 'opens Northwest Passage'". BBC News. 2007-09-14. Retrieved 2007-09-14. ^ "The Scramble for the Arctic: The United Nations Convention on the Law of the Seas and Extending Seabed Claims". Paper presented at the annual meeting of the Midwest Political Science Association 67th Annual National Conference, The Palmer House Hilton, Chicago, IL Online. 2009-04-02. Retrieved 2009-11-09. ^ "Conference in Ilulissat, Greenland: Landmark political declaration on the future of the Arctic". Ministry of Foreign Affairs of Denmark. 2008-05-28. Archived from the original on 2008-06-15. Retrieved 2008-06-06. ^ "The Ilulissat Declaration" (PDF). um.dk. 2008-05-28. Retrieved 2008-06-06. ^ "Satellite imagery moves Hans Island boundary: report". Canadian Press. July 26, 2007. Retrieved 2007-08-27. ^ "New proposal would see Hans Island split equally between Canada and Denmark". National Post. April 11, 2012. Retrieved 2012-05-05. ^ Weber, Bob (2015-11-15). "Canada, Denmark should turn Hans Island into a condominium: academics". CBC News. ^ a b "Transnational Issues CIA World Fact Book". Cia.gov. Retrieved 2012-01-10. ^ "Secretary of Commerce approves fisheries plan for ArcticSecretary of Commerce approves fisheries plan for Arctic". Worldfishing.net. 2009-08-20. Archived from the original on 2009-09-15. ^ Randy Boswell (2009-09-04). "Canada protests U.S. Arctic fishing ban". Canada.com. Archived from the original on 2009-09-15. ^ Todd P. Kenyon. "Unclos Part Iv, Archipelagic States". Admiraltylawguide.com. Retrieved 10 January 2012. ^ The Edmonton Journal (9 April 2006). "Northwest Passage gets political name change". Canada.com. Archived from the original on 2 April 2016. Retrieved 31 May 2015. ^ "American Economic Growth in the Information Age". ISUMA. Archived from the original on 31 January 2002. Retrieved 8 May 2015. ^ Todd P. Kenyon. "Unclos Part Iii, Straits Used For International Navigation". Admiraltylawguide.com. Retrieved 10 January 2012. ^ "The Northwest Passage and Climate Change from the Library of Parliament – Canadian Arctic Sovereignty". Parl.gc.ca. Retrieved 10 January 2012. "Arctic Map shows dispute hotspots". BBC. 2008-08-05. "Maritime jurisdiction and boundaries in the Arctic region" (PDF). International Boundaries Research Unit, Durham University. 2008-07-24. "Arctic Sovereignty Policy Review" (PDF). Carleton University School of Journalism & Communication. 2011. Archived from the original (PDF) on 2012-03-01.